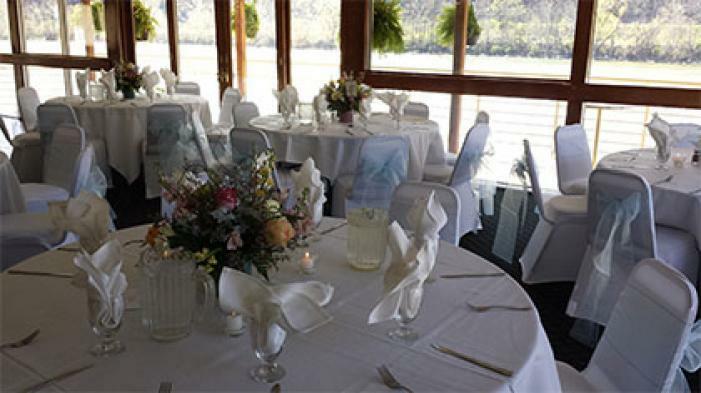 Riverside Landings Banquet Hall and The Greek Orthodox Social Hall are located just 12 miles east of Pittsburgh nestled in the quaint town of Oakmont, Pennsylvania. We are along Pittsburgh’s riverfront and offer scenic, panoramic views of the Allegheny River. Your guests can enjoy cocktails on our deck overlooking the river at Riverside Landings. We are confident that we can provide the perfect venue for your event! We have been in operation for over 35 years and proudly host over 150 events a year. Whether you are planning a wedding reception, baby shower, graduation, business conference or any other special event we are here for you! We have two amazing venues, two fabulous caterers to choose from and a friendly, professional staff on hand to serve you. Contact our Certified Events Manager today to schedule a private tour or with any questions you may have. Thank you for considering our venues and we look forward to celebrating with you! This rental is located in Oakmont, Pennsylvania 15139 and has 0 upcoming nearby events.